Hatters boss Nathan Jones declared another two days training was the better bet for midfielder Luke Berry rather than a late cameo against Southend United on Wednesday night. The 26-year-old, who suffered a serious ankle injury last term, also needed a minor knee operation in September, meaning he has played just once so far this season, that at West Bromwich Albion in the Carabao Cup in August. 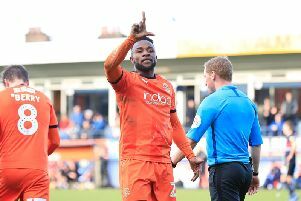 He was back on the bench for the midweek Checkatrade Trophy clash with the Shrimpers but didn’t come on as Luton went out on penalties, and when asked why the former Cambridge man didn’t get any match action, Jones said: “I didn’t think it was worth risking. “With the pitch as it was, really soft, and he’s had injuries structurally, so we didn’t feel it was necessary to do that. Meanwhile, Jones confirmed on Wednesday night that Town are almost at full strength for the clash against Fleetwood Town this weekend, adding: "We’ve got a full squad, there's only Alan McCormack that remains out. "Everyone else is much fitter and much more game ready, so that stands us in good stead. "We’ve got a few days now to prepare them, one or two will have to rest after today, but they’ll all be ready for Saturday."